Developing training plans, task analyses, cues and reinforcement strategies, and techniques such as chaining, shaping, and self-managed learning. Vocational assessment, career development skills, and vocational profiling. Effective job training, job design, natural supports, customization. Designing a marketing plan, disclosure, social networking, and other tools of job development. 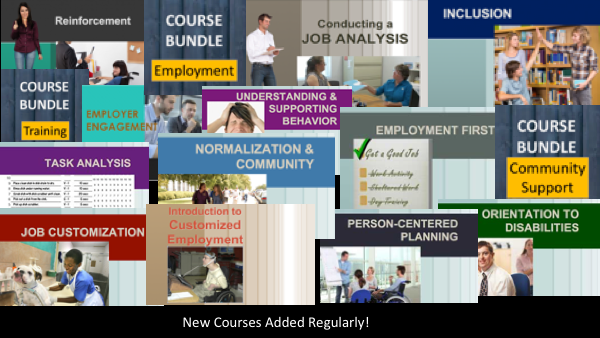 TRN now offers over a dozen on-demand Certificate training of 2-4 hours on various topics, such as Person-Centered Planning, Task Analysis, Employment First, and more. We also have visual resume templates, electronic employment planning forms, and other resources. Receive announcements of new courses, products and sales.